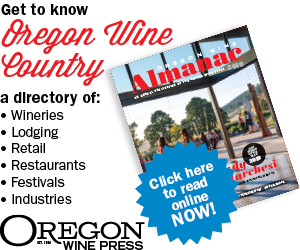 In the September 2014 edition of OWP, and more recently in my book, “Oregon Wine Country Stories: Decoding the Grape,” I tell the story of Salem’s Honeywood, the oldest bonded winery still operating in our state. Honeywood produces both still wines from grapes and a portfolio of fruit wines reflecting one way the industry circumvented the blue-nosed spasm of Prohibition. This historical distinction obscures other key points. As told earlier, the late Mary Reinke, who took control of this business, lobbied successfully to allow producers to sell wines where they’re made; thus, the tasting room. In a remarkable, agreeable way, the Gallick family, who purchased the Honeywood operation in 1973, continues to illuminate this frequently devalued segment of the state’s $3.7 billion wine business. Don’t expect gently rolling hills or rows of vines; it’s rather a happy delicatessen, souvenir shop, gathering place and wine bar in a building once a creamery. Farther north, in Dundee, the tiny stretch of tasting rooms typifies, for some, “visiting wine country,” which is sort of like Columbus turning his three ships about when they passed the Azores. The tiny town remains one of the epicenters of Oregon’s wine pioneering, and here a suggestion of the frontier still reverberates. This wine-lined area of 99W appears a jumble of facades. Argyle appears to be a grand colonial. Alit resembles a post-modern gas station. Zerba is cottage-like and contains zebras — a dyslexic joke. To pet them, you’ll have to venture inside where you can sample the winery’s Walla Walla Valley estate wines. Dundee exudes a Wild West feel so essentially Oregon, doing its own thing and getting away with it. The first time we experienced Ghost Hill outside nearby Carlton, it rained. So? This is Oregon. Well, the tasting room was a three-sided workshop with a theatrical fourth wall comprised of a rolled-up plastic drop cloth. This was not Napa on the Food Network but rather a premium vineyard property already more than a century in the same family. No wonder its Pinot Noir earns praise: There’s history in the air, not to mention a prospector’s spirit and the ghost of his horse — sort of Sleepy Hollow West. What will the next wave of winery tasting rooms look like? The tasting room is more than simply the portfolio. It, too, must address the commercial and spiritual ecologies that, like the Hydra, have many heads, all talking at once. Alit makes a logical starting point — with several back stories and brands we need not cover here. Suffice to say Alit expresses the poise of a maturing industry. Consider, for instance, its tasting room. The spare interior with a curvaceous counter and dramatic art backdrop feels simply cool, a minimalism antithetical to faux castles and spare Quonset hut tasting rooms. Alit tasting room manager Paul Johnson notes, “We wanted to change the vibe. We wanted to produce the feel of a lounge, with conversation groups to interact about our wines and our pricing model.” Thus, Alit offers wine with a cost sheet rather than price menu to display the actual margins between the vines and consumers’ wallets. Aluminum and glass create the impression one’s in the middle of Dundee because it’s directly outside. Sadie, the affectionate, diffident wine dog, seems the only concession to a rural past. She’s no hologram; she must go out periodically. The future holds more free-standing, virtual wine places where no vineyard needs to beckon from the door or the winemaking done elsewhere. Remy moved its tasting room to a renovated farmhouse in Dayton, just off 99W. There are vines here, but winemaker Remy Drabkin makes her wines in McMinnville. More likely are village renaissances where the tasting room acts like a corner bar, welcoming locals as well as tourists. Walla Walla could have faded into not so genteel decay had it not welcomed about 50 tasting rooms, most within stumbling distance. Newberg is attempting the same for its central core, featuring places like Vintyr, Artisanal, Longplay, Chehalem (Stoller) among some dozen operating wineries winning consumers without the picturesque appetencies of wine postcards. Like the neighborhood pub, these tasting rooms have also become social centers, adding needed energy to places eclipsed by highways and shopping malls. “Think of the storefront as a reason to take some of your wine experiences in town,” Dave Rasmussen, vintner and president of the Newberg association of local wineries remarked. The tasting room of the future may include an Olympic kitchen and miles of marble counters, or it may look like an airport terminal that dropped down into an AVA. But the mission seems unchanged: Find and retain good customers, educate them and pour some notable wine — the message in a bottle. The message? Balance cellar clubs and loyalty programs with the inevitable crush of tourists bound to show up sooner or later.